Got a little more done on the thickness sander that I am building. 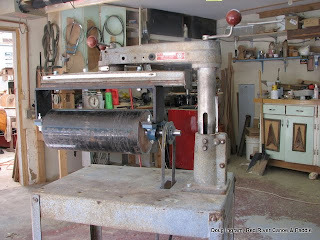 I am converting an old Delta Super 900 radial arm saw that I picked up at the dump. I had to make up some plywood discs to mount the drum to the shaft. It was critical that the holes be perfectly centered. So, after a bit of head scratching, I figured out how I was to do that. Mission accomplished, I then mounted the drum on the bracket, and cut a hole on the saw base. The belt is there just to check the clearances. Next step is to mount the motor. After that is to make the dust collection shroud and table/feed device. Posted by Doug Ingram at 10:34 a.m.